Dr. Emery holds a Cavitron- an ultrasonic scaler. If you have recently visited The Loft for your routine check-up and cleaning appointment, then you may have noticed a dental instrument that uses a lot of water. Many patients have asked us what this instrument is, what it does, and why they may have never seen it before. These are all great questions that are on the minds of many patients, so we’d like to share a few thoughts with you on Ultrasonic Scalers. While we love to write fun, upbeat blogs, we also feel it’s important to educate our readers on various dental topics. Hopefully you’ll feel this blog is educational with a Sugar Fix twist! Ultrasonic Scalers (USS) are not new to the dental field, in fact, power scalers have been used in dental offices as early as the 1950’s! What has changed since the 50’s is our knowledge of the ways we can use these instruments. Originally created solely to remove plaque and calculus (hard tartar buildup) above the gum-line, now these scalers are known to effectively clean root surfaces below the gums! The devices create “shockwaves” that destroy bacteria and produce vibrations to break off tartar, while irrigating the pockets between your gums and teeth all at the same time. 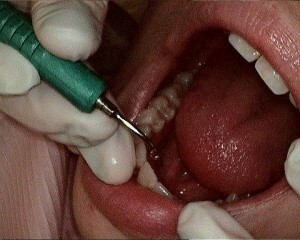 Using Ultrasonic on a Sugar Fix patient. Some people may think this is a lazy version of getting your teeth cleaned, but this is definitely not the case! Hygienists and dentists are specifically trained to use these power scalers; each brand of USS differ slightly from the next and have multiple instrument tips that are used for specific tooth surfaces and periodontal pocket depths. WHAT?? Sounds like a lot to take in, but you can rest assured knowing that Dr. Emery & her team will ALWAYS put your comfort at the top of their priority list! 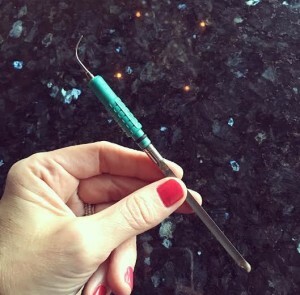 If you are a patient who has never had a power scaler used during an appointment, it may seem strange initially, as there is a lot that goes on that is not common with the use of traditional hand instruments. For example, USS often create aerosol spray, but this can be compared to a mist of water that you might spritz on yourself on a hot summer day in Chicago! Additionally, there is a high-pitched sound that results from the instrument use, but this can be combated by listening to our Bose noise-canceling headphones during your visit! The general consensus in the dental community is that the standard of patient care is met by using with both hand instruments and ultrasonic scalers. This provides our patients with the best quality of care possible and leads to the achievement of overall periodontal health. Be sure to ask any of us about ultrasonic scalers during your next hygiene visit at Dr. Emery’s office.